Crystal River Cruises ushered in the next phase for its expanding “Rhine Class” fleet of river vessels, as the keels were laid for the company’s next two new-builds, Crystal Debussy and Crystal Ravel at a ceremony at MV WERFTEN shipyard in Wismar, Germany. In spring 2018, the two all-balcony, all-suite vessels are set to embark on their maiden voyages along the Rhine, Main and Danube. In the presence of Tan Sri Lim Kok Thay, Chairman and Chief Executive of Genting Hong Kong; Jarmo Laakso, Managing Director of MV WERFTEN; Josef Lumetsberger, Crystal River Cruises’ General Manager of Operations; Manfred Korous, Managing Director of Future Development and Director, Crystal River Cruises; and Harry Glawe, Mecklenburg-Vorpommern’s Economics Minister, plus numerous distinguished guests, the first sections of the luxury vessels were ceremoniously lowered into position on keel blocks. 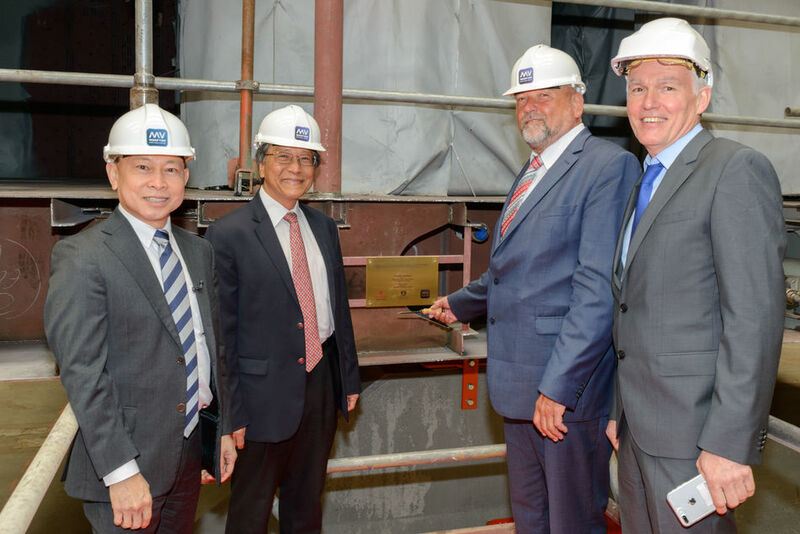 Tan Sri Lim and Minister Glawe placed the traditional lucky coins on the keel blocks before the first two sections, each weighing 170 tons, were laid down. "We are pleased to celebrate this important milestone, the start of the block assembly, for two more ships for our brand Crystal River Cruises today at our own shipyard. These ships will offer their guests the highest standards in luxury cruising on Europe's most beautiful river routes," said Tan Sri Lim during the keel-laying ceremony. “This ceremonial act represents a tremendous achievement for Crystal River Cruises and the entire Crystal fleet, as we introduce the next chapter of the continuing story of Crystal innovations throughout the travel and hospitality industry,” said Crystal CEO and President, Edie Rodriguez. The most prominent features aboard Crystal’s “Rhine Class” river vessels: the river cruising industry’s first all-balcony, all-suite designs boasting every category of accommodation perched above the waterline. All four river yachts will also offer Crystal’s acclaimed butler service in every room category, plush king-sized beds that face toward the Panoramic Balcony-Windows, walk-in closets and dual vanity in the bathrooms in most categories, ETRO robes and slippers, wall-mounted flat-screen HD TVs, and Nespresso machines. Additional enticing features include Crystal’s farm-to-table, Michelin-inspired cuisine in multiple, open-seating eateries: the elegant Waterside Restaurant, namesake Bistro cafés and the exclusive Vintage Room; and the Palm Court. Crystal Debussy and Crystal Ravel will measure approximately 135 metres in length and 11.5 metres in breadth, accommodating 106 guests in Crystal’s signature, all-suite luxury. Beginning in spring 2018, Crystal Debussy and Crystal Ravel will sail routes of seven, 10 and 14 days between Amsterdam, Basel and Vienna. The building of the river yachts – and other upcoming vessels for the Crystal fleet – at the MV WERFTEN Shipyard is significant as well, given that the yard shares a familial connection with Crystal. Crystal’s parent company Genting Hong Kong completed the acquisition of the Lloyd Werft ship building yards in 2016 in anticipation of the company’s extraordinary brand and fleet expansion, which, by 2022, will see four new build luxury river yachts, the world’s first purpose-built polar class Crystal Endeavor mega-yacht and the first of Crystal Cruises’ Exclusive Class polar class ocean ships with Crystal Residences constructed at the yard.